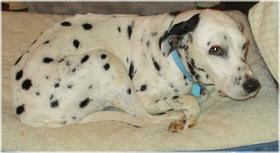 Dotty is a wonderful girl who strayed onto the porch of a friendly farm owner. She was let in for the night, fed, and kept warm until the county animal shelter could pick her up. Her owner never came to claim her, and we suspect he just didn't want her any more and abandoned her in a remote part of the county. She came into the county shelter with a body score of 2/5...severely underweight, dirty, literally starving, and with every bone visible from across the room. The good news is that she was NOT heartworm positive. She did, however, have Lyme Disease and Ehrlichia as well as filty, infected ears. Between the shelter vet and the rescue's foster mom, Dotty is now completely vaccinated (including required boosters), gaining weight (though still less than 50 pounds), and on the road to health. She needs to have a cyst removed from her shoulder (happening next week), and she still needs to be spayed when she is stronger. Dotty has been a model guest in her foster home, where her favorite passtime is laying on the back porch in the sun. She is still excited about seeing her food bowl twice a day, and she is walking better now that she has been been on a joint supplement. When her vet says she is strong enough, she will be spayed. 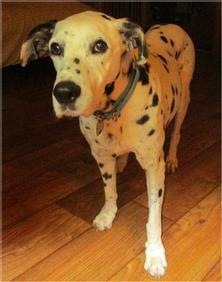 When recovered from that surgery, Dotty will be ready and eager to move into her forever home! Keep checking back for updates.